← School gets out, weight goes up. Why now is the time to focus on preventing childhood obesity. Candy and soda for breakfast, again! This is a follow-up to a piece I wrote previously about an analysis of what kids (and adults) commonly eat for breakfast. Considering that this is one of the topics I talk about most frequently, it seemed like time for an update It is also my Health & Fitness column in the Aiken Standard this week. Some popular breakfast foods targeted at children include sugar-sweetened cereals, pastries, and bars, many of which look like candy or dessert. Pop Tarts and some granola bars are covered in frosting and favorite cereals often contain marshmallows, chocolate, or are shaped like cookies. No surprise that these foods are as high in calories and sugar as cookies or some candy bars! This really isn’t much different for adults. 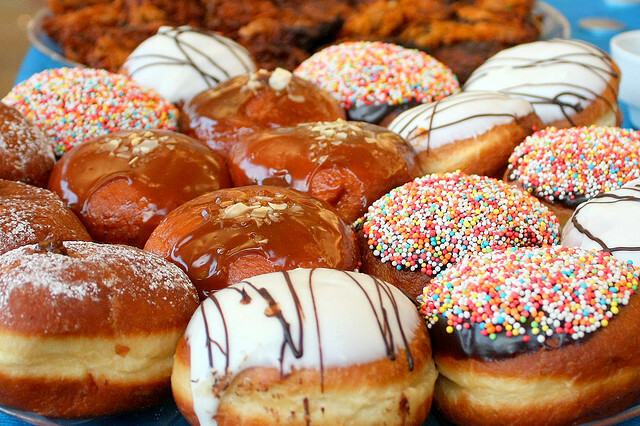 Breakfast foods like donuts and pastries are almost always topped with icing and it would be difficult to distinguish many muffins from cupcakes. For many people, coffee isn’t just coffee anymore, but a drink that contains as much sugar and as many calories as a milkshake, sometimes with whipped cream on top. One of the biggest offenders for both children and adults is yogurt. Low-fat and fat-free flavored yogurt is almost always sweetened with sugar. This is true for the yogurt tubes that kids love and the Greek yogurt that is widely thought to be healthy. Sure, it contains protein and bacteria that seem to be beneficial, but the added sugar makes it equivalent in terms of calories and sugar to frozen yogurt or ice cream. Some of these yogurts even come with toppings, like bits of chocolate, just like fro-yo! The good news is that you can make your breakfast healthier without too much effort. While there is much debate about what constitutes a healthy breakfast, there is agreement about what it doesn’t include—lots of added sugar! Look for cereals that are low in added sugars and high in fiber. Include real fruit, fruit juice, and milk (or soy milk) whenever possible. If you have time, eggs are an excellent source of protein and healthy fats. Yogurt is good, too, but watch out for added sugars in flavored yogurt. Whole grain toast or a bagel with peanut butter makes a good alternative to Pop Tarts or breakfast bars. As a general rule, steer clear of foods that look like dessert. Marshmallows, chocolate chips, and frosting are best left for after a healthy meal, not a replacement for it. This entry was posted in Candy and soda for breakfast!, Health & Fitness. Bookmark the permalink.